Asiatic Lily makes a perfect plant for landscape design. One of the hardiest and most popular lilies grown, this true lily when planted correctly, produce long-lasting flowers. Beginners new to planting bulbs find Asiatic Lilies among the easiest of all lilies to play with. They are the first lilies of the season to flower, and they multiply fast. With simple care, these temperate northern hemisphere natives, grow and do well in USDA hardiness zones 10 all the way to 3. Oriental Lily shares a number of features with the Asiatic Lily. However, they also possess distinct differences and no one should see them as the same. A few of their dissimilarities include fragrance, sizes, and bloom color. The bulbs of Asiatic Lilies appear large, 5 to 6 inches (12.5 to 15 cm) across, generally white along with a tint of pink. The bulb color plays no part in flower color. Lily bulbs when harvested often look pinkish after exposure to sunlight. The large bulbs store a lot of food giving them plenty of flower power in the spring, even with sub-par soil, water and fertilizer. Plant Asiatic Lily bulbs in early spring or fall before frost in a well-drained, fertile soil. This allows the plants to develop a good root system. Adding organic matter will help improve the soil. When planting bulbs, place them 12 to 18 inches (30 to 45 cm) apart and 4 to 6 inches (10 to 15 cm) deep in full or partial sun. A location receiving morning or late afternoon sun with 6 hours of sunlight minimum is preferable. Asian Lilies like a slightly acidic (6.5 pH.) soil. When you receive Asiatic bulbs plant them as soon as possible to keep them from drying out. For a nicer look, place 3 or more lily bulbs that will eventually multiply into groupings. Plant them among other flowers to provide the bulbs with shade. A bulb planter comes in handy to make a hole at just the right depth. 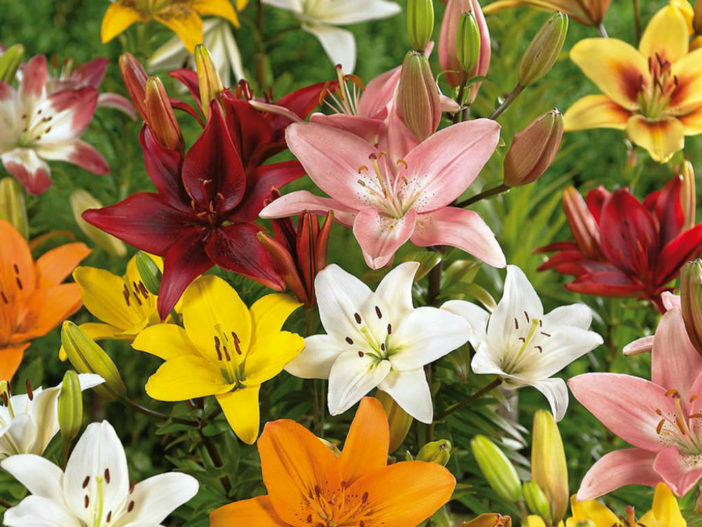 The best Asiatic Lily care will have bulbs planted with good drainage, but not a dry soil. They need 1 or 2 inches (2.5 or 5 cm) of water per week. During hot and dry weather, Asiatic Lilies may need supplemental watering to ensure the root zone stays well moistened. The soil should remain moist and not soggy. As a guide, water when the top 1 inch (2.5 cm) of soil below the surface becomes dry will provide the plant with the needed moisture for them to thrive. A light ring of 5-10-10 fertilizer around the lilies, mixed into the topsoil provides the nutrients required for Asiatic Lilies to thrive. This type of fertilizer supplies phosphorus and other nutrients needed for large and healthy blooms. Apply the fertilizer once Asiatic Lilies begin to grow each spring following the application rate directions on the fertilizer bag. Generally, these lilies do not require frequent fertilizing. Once the foliage dies back naturally, cut the dead foliage to the ground. Add a layer of 4 to 6 inches (10 to 15 cm) of mulch to provide the bulbs with protection during winter. This helps maintain soil temperature and prevent heaving. Remove the mulch during spring after all danger of the frost passes. This will give room for new growth to appear. A 2-inch (5 cm) layer of bark mulch applied after removing the winter mulch helps to preserve soil moisture and prevents weeds. Propagate Asiatic Lilies from stem bulblets, bulb scales, stem bulbils and bulb division. The fastest way comes from splitting plump bulbs. Pull them apart and plant them separately. Asiatic Lilies find themselves susceptible to fungal infection and aphids. To get rid of aphids on Asian Lilies and make sure your plants remain aphid free, use neem spray oil insecticide, summer oil or Malathion. Also, use fungicides such as green guard, bravo or a tablespoon of baking soda in about 2 liters of warm water for fungal infection.